Pre-heat your oven to 200 degrees centigrade (400 F - gas mark 6). Our nicely dressed roast - a good kilogram for four people. Salt and pepper the roast and place it in a roasting dish. Cut off a small slice of meat for the gravy. Then put the roast into your pre-heated oven - 1.5 hours for this 1 kg roast will do nicely. Chop up your onion (I'm using a red onion here, but it doesn't really matter). Cut off a small part (5%) of your roast for your gravy. Cut into small bits. 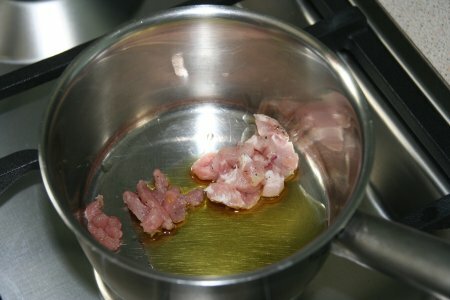 Pour the olive oil to a small saucepan, heat up the oil and add the meat strips. 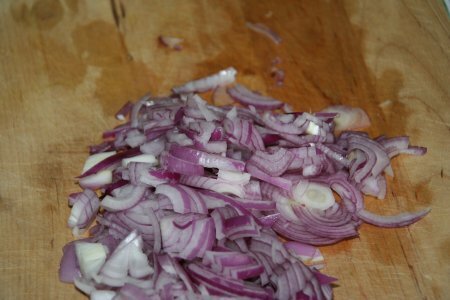 Then add the onion and fry together until the meat and onion looks like this - a couple of minutes will do the trick. 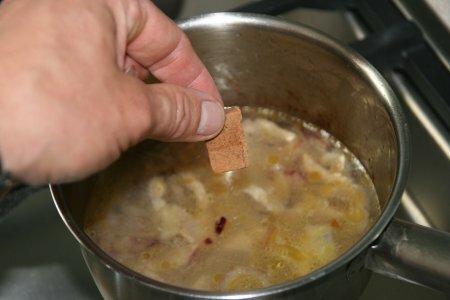 Now add the stock cube. ... as anyone who likes sweet and sour pork will appreciate. Also add the oregano. 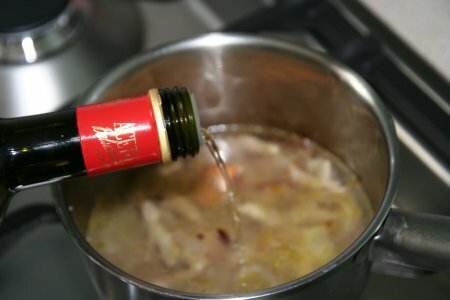 Talking about sour - now add a teaspoon of white balsamic vinegar. Now press the garlic into the mixture. This is where my guests arrived and I was too embarassed to take any more photos - I will take some next time I prepare this dish and add them, I promise! Let the gravy stock simmer on a low flame for a good hour (you can do that whilst the roast is in the oven...), best with a lid on the saucepan. Replenish the water so you will end up with the same amount you started off with. After you have started the gravy stock, check your roast. As soon as you have some pork fat collecting in your roasting dish, open the oven every 15 minutes and pour the grease with a spoon over the roast. This will ensure that you get a nice crackling. 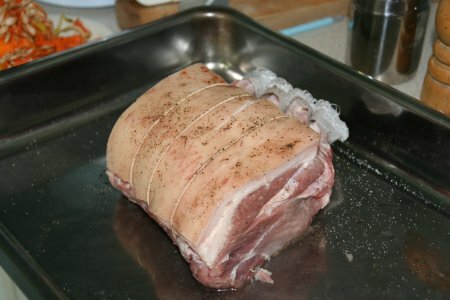 Once the roast is done and the crackling looks nice, take the roast out of the oven. Take the roast out of the dish onto your cutting board and put the roasting dish on the hob and light a flame under it. 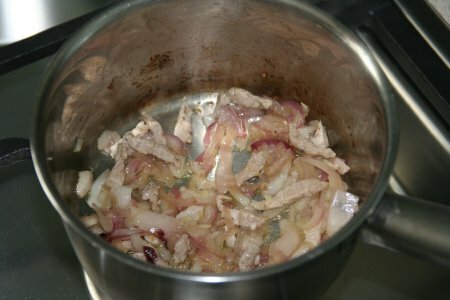 Separate the solid bits (meat and onion) from your gravy stock and throw them away. Pour your gravy stock into the roasting dish and dissolve all the caked-on residue with it. 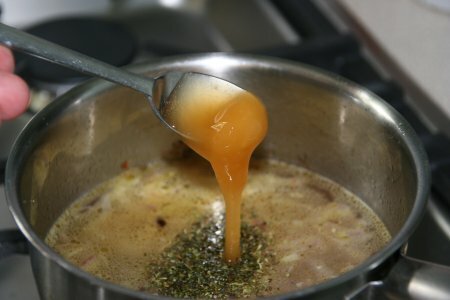 Now separate the fat from the gravy with a gravy separator or a spoon. Dissolve the corn flour in some water and pour about half of this mixture into the roasting dish. 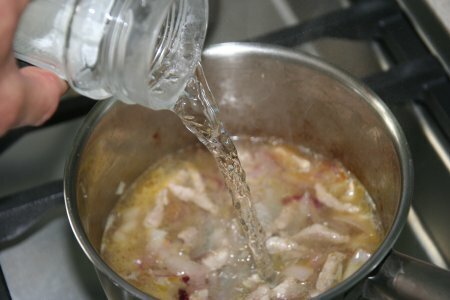 Bring to a boil and stir - adjust the thickness of the gravy with the corn flour/water mixture. Add salt and pepper to your taste. 10 A good recipe with clear instructions & pictures. Thanks. 10 This was FANTASTIC and very easy. 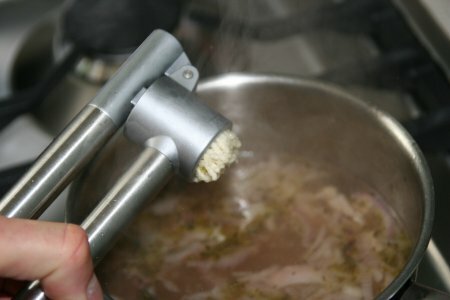 10 Sounds delicious!Keep onion peices and meat peices and add to a homemade soup! 9 I've never made good gravy before, thanks for sharing! 10 very different much better than apple sauce,thanks,Stuart in S.A.
10 Yummm... I slow cooked our pork roast but used this recipe for gravy, SO GOOD! Hubby requested apple sauce to go with the pork which I also made, but once he tasted the gravy he was blown away. 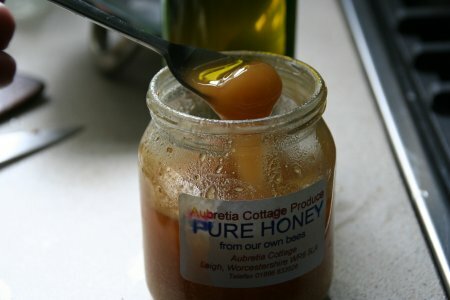 I left out only the honey, as we prefer our savouries... very savoury :) Thanks for an awesome recipe! 10 Your pages are wonderful! As someone who never learned to cook, you make it so simple. Thank you! 10 Lovely gravy. 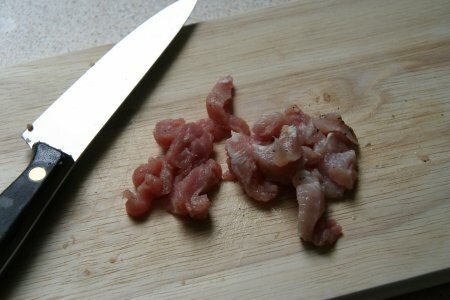 I cook the Sunday roast every week and usually use the veg water, cornflower and meat juices only to make gravy so am wondering if you have similar instructions for chicken and beef? 5 NICE TIPS FOR GRAVY. TRIED ONCE. WILL TRY AGAIN TO PERFECT! 10 10 i have now cokoked this recipe for a vast vasriety of university collegues and every time it has been a great success!! 10 very nice. seems that you bound 2 pieces. very cleaver. hope it wikk be tasty, too. thanks a lot. 10 fantastic gravy - which is quite tricky to get from pork!